I picked up an Angulo 11′9″ a week or so ago and wanted to test it as a big all around stand up paddle surfboard. Jim at Tropical Blends Surf did a super nice job of customizing the deck pads. You can see that there is a tail pad, deck pad and nose pad. This board went through a series of sessions to see what it could do. I would say it passed with flying colors. 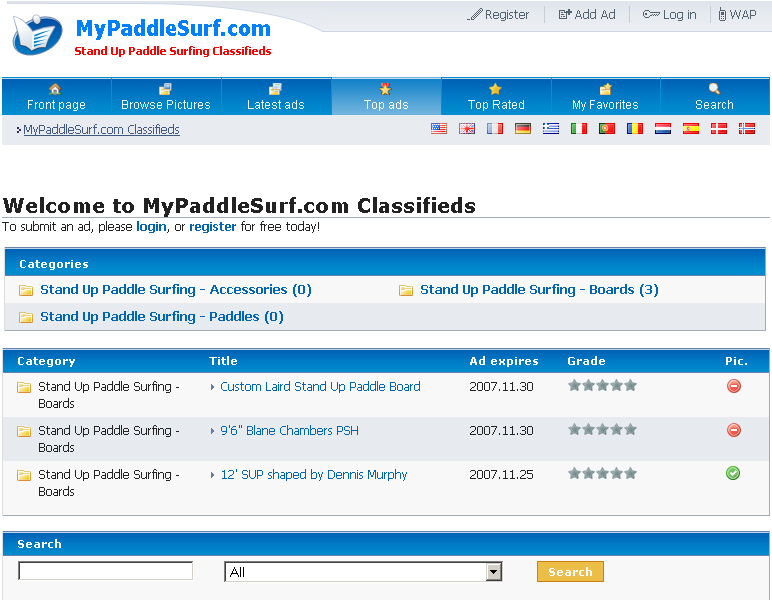 The team behind StandUpPaddleSurf.net recently launched its Classifieds site catering to the growing number of stand up paddle enthusiasts around the world. MyPaddleSurf.com connects stand up paddle surf buyers and sellers, providing them with a platform where they can exchange SUP-related goods and services. The site adds to StandUpPaddleSurf.net’s growing service offering. SUPS.net aims to build a locus where SUP fans can gather information and exchange ideas about this relatively new water activity that is sweeping the world’s oceans. Ron House gives a tour of his shaping factory in San Clemente, California, where he talks briefly about the beginnings of his career as a board shaper. This was at a time when short boards from Australia were of relatively new concept in the shores of California. Ron also explains how he met Laird Hamilton and started shaping stand up paddle boards for him — all before the rise of stand up paddle surfing as a popular water sport. I’ve been bugging Blane Chambers for about a month now to come to his new shop and let me get a Paddle Surf Hawaii stand up paddle surfboard. My friend Carnet can’t stop talking about the one he’s riding and how he’s buying another new one for both him and his wife so I had to go see for myself. These boards are hard to get. There aren’t many in production and they go fast so I think Carnet has been waiting a while. It’s a funny coincidence but Blane and I worked together almost a decade ago for a short period of time. It was nice reconnecting. 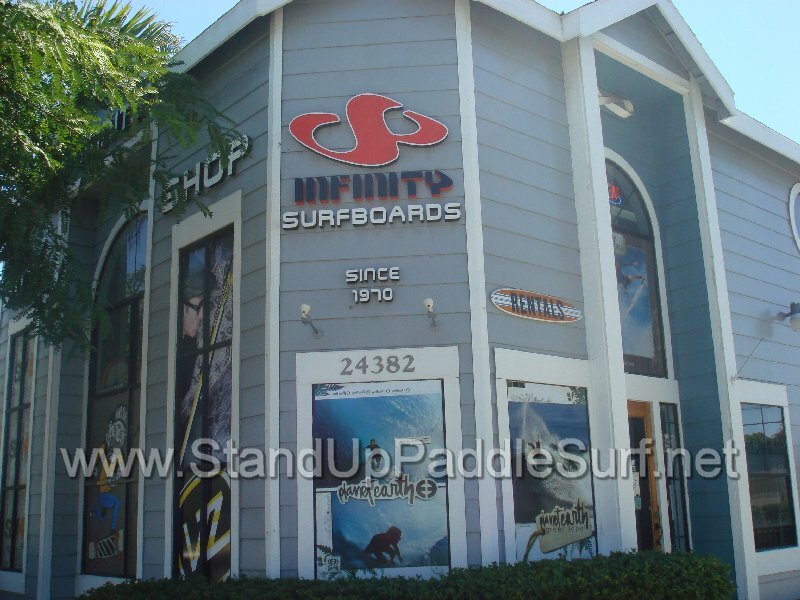 In my visit with Steve Boehne, master stand up paddle surf board shaper and owner of Infinity Surf and Ku Ku Hoe, Steve shared some very insightful tips on how to best choose a stand up paddle board and things to consider. Check out this video to hear Steve first hand. I was at the C4 HQ last week and looked over and saw the new C4 production 9′ bat tail stand up paddle surf board sitting on a table outside as I was about to leave. I just had to show this on standuppaddlesurf.net so I took out my digital camera and shot some pictures and a short video of the board. It’s never too early to start off the kids at stand up paddle surfing. I went to Waikiki Beach this past weekend to check out the stand up paddle surf division for the HASA surf contest. HASA said the heat would be at 1 pm and when I arrived at 10 am the final was already done. That gave me a lot of time to play in the ocean with my boys and I finally got my 4 year old on the stand up board. What a beautiful day in Honolulu for a Stand Up Paddle Surf contest! My very first foray into a competitive surf environment. Small kine waves at Bowls for our 30 mins one heat final. Six of us out there and the best waves of the day! Nothing special, but enough to show off the grace and form of SUP surfers. I had a bunch of fun rides, lip hits, paddle tricks and noserides. When I got in the realities of surf contests hit me.. 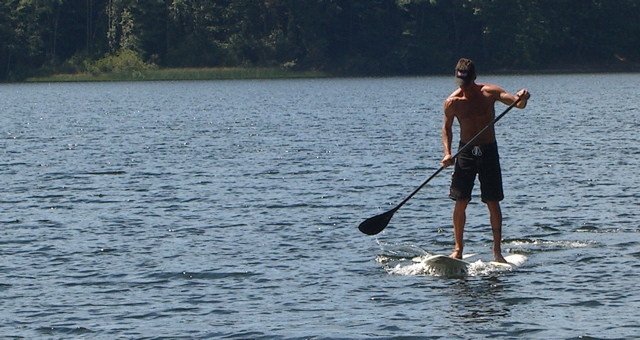 I had killer rides and would have placed somewhere in the top half, but what I didn’t know is that you get points deducted if you are on the same wave as other folks… the rule is usually first on their feet, but on a SUP you are already on your feet. So I did what I do with friends.. hop on together and if there’s room ride, if not pull out. Well.. that didn’t sit well with the judges and negative points I went. Oh well… there’s next time. It was all for fun anyways. I met up with Joe Blair last week at Lego Land’s parking lot to check out the master shaper’s 9′9″ stand up paddle surf board. It was my last day in San Diego and there was no other way to meet up. I’m glad I did as the custom Blair stand up paddle board was worth checking out and Joe had some great stand up paddle info to share. Life is not measured by the breaths we take, but rather by the moments that take our breath away. Waiting for waves is alright, most People spend their Lives waiting for nothing. 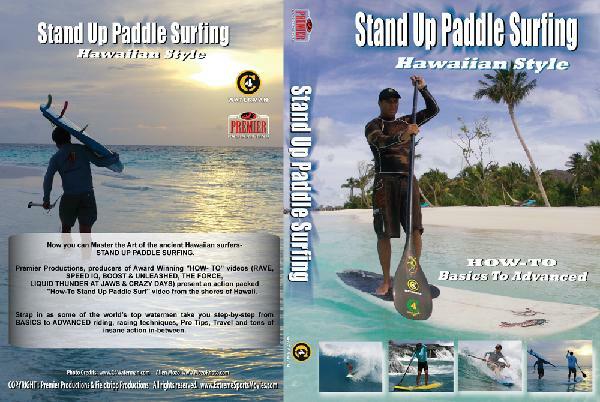 HONOLULU – (Friday, October 12, 2007) – C4 Waterman, the leaders in the stand-up paddle surfing market, have teamed up with Premiere Productions to produce Stand Up Paddle Surfing, Hawaiian Style, Volume 1: Basics to Intermediate. I read a tip about what to do with the paddle when you wipe out and get dragged in the whitewash. Stand up paddle surf boards are BIG so when you fall in big surf you get dragged like a rag doll. There’s a way to make your paddle an asset instead of a liability in a wipe out. 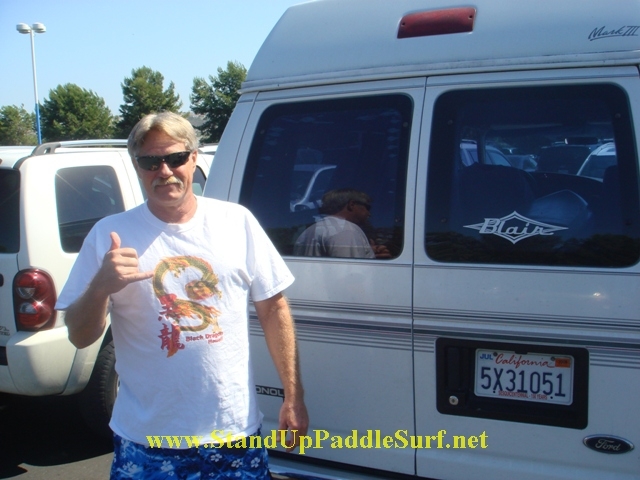 You are currently browsing the Stand Up Paddle Surfing in Hawaii - StandUpPaddleSurf.net weblog archives for the month October, 2007.